This year, we are trying something new in the garden, POTATOES. Given that potatoes are cheap and readily available at the store, and they can be easily purchased from a local source year round, Why Potatoes? There is some concern that potatoes, since they are a root vegetable, have a greater risk of picking up nasty chemicals from overfertilized or polluted soil. So, what’s this about growing potatoes vertically? I will be ordering “Yellow Finn” variety seed potatoes from Seed Savers Exchange. A 2.5 pound bag of seed potatoes (10$ + S/H) is described as enough for a 25′ row, so I think it will be more than enough for 16 square feet. I may be able to share if someone is interested. Next story The three habits of highly effective tomatoes. Tom, Amy has red hair and I believe is geneticaly predisposed to eating potatoes. By the by I am in the market for that computer we talked about over Christmas. Let’s get the conversation started. Is there a way to email you from this site. or should I message you via facebook? Let me know. I randomy found your blog searching for info on an antique potato bin I just found at a used furniture store. If you like sweet potatoes they are super easy to grow I dedicated 2 22inch ceramic planters and a large tree container a nursery gave me to sweet potatoes. I havested about 35 potatoes some over 4 inches in diameter. They are viney decorative plants as well. I like the blog by the way. If I had one my intrests would pretty much be subtitled the same way good luck. 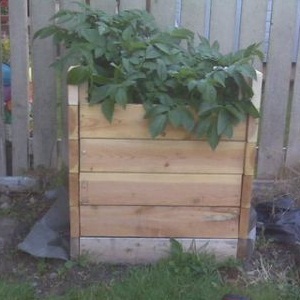 I may have to try out your raised bed design for adding levels i like that. I have 5 raised beds and a large inground area that I will probably convert to raised at some point. Cool, thank you for visiting and thanks for the kind comments. I hadn’t considered large ceramic planters, but it seems like an easy way to increase my growing space. Potatoes were a lot of fun to grow, so maybe I will try sweet potatoes as well. So, how was the potato harvest, how did this project go? The first year I harvested in the early fall and got about 25 pounds, This year I harvested way too late, (late January) and got a larger harvest but with a few rotten potatoes and mold which set in after a week after harvest stored indoors. I don’t think I dried them quickly enough. It is a good crop, but after some issues i am taking a year off potatoes and will come back to it next year with fresh seed stock.